1) If you are a layperson, working in a NON-MEIDCAL position, the AHA Heartsaver CPR AED or Heartsaver First Aid CPR AED is designed for you. These courses are for anyone with limited or no medical training who needs a course completion card in CPR and AED use to meet job, regulatory or other requirements. 2) If you work in the healthcare field, the AHA Basic Life Support (BLS) course is designed for you. These courses are for healthcare professionals who need to know how to perform CPR, as well as other lifesaving skills, in a wide variety of in-hospital and out-of-hospital settings. How long does it take to be trained? Classes vary in duration. On average, the in class room certification takes about 3 hours. Skills checks for online students are one hour. Online training depends on the student taking the training. Will my employer except my online certification? We advise that each student taking classes for employment verify which class they will need as well as how they take the class. Some employers do not except online certifications even though the same information is covered in both classes. Don’t be fooled by the online training classes offered for $19.95, our classes are certified through the American Heart Association. If our company purchases an AED, does it increase our liability? No. The Cardiac Arrest Survival Act (CASA) instructs the Secretary of Health and Human Services to make recommendations to promote public access to defibrillation programs in federal and other public buildings. The act also extends Good Samaritan protections to AED users and the purchasers of the devices in all states. The price of an AED varies by make and model. Most AEDs cost between $1,500–$2,000. 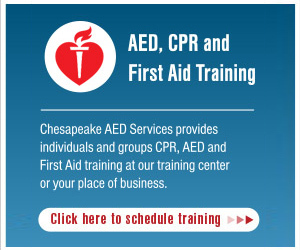 What steps should an organization take to buy an AED for its premises? Training of all users in CPR and operation of an AED (this can be achieved through the AHA’s Heartsaver AED Course). Physician oversight to ensure appropriate maintenance and use of the AED. Notifying local EMS of the type and location of AED(s). Children over age 8 years old can be treated with a standard AED. For children ages 1–8, the AHA recommends the pediatric attenuated pads that are purchased separately. Can anyone buy an AED? AEDs are manufactured and sold under guidelines approved by the Food and Drug Administration (FDA). The FDA may require someone who purchases an AED to present a physician’s prescription for the device. What’s public access to defibrillation? Public access to defibrillation (PAD) means making AEDs available in public and/or private places where large numbers of people gather or where people who are at high risk for heart attacks live.